With Mother’s Day well and truly out of the way, it’s Daddy’s turn to be spoiled. Although there are many Dad’s who would appreciate a pair of new socks, there are so many more meaningful gifts to give to a Dad who is truly deserving of something precious this Father’s Day. If you look around you nowadays, whether it be at the park, at school, when your doing your local shop, you can see just how involved Dad’s are with their children. They are actively involved in rearing their children and many do not just see their role as possibly being the main breadwinner, they want to spend quality time with their children and are aware that it’s so important for both Mum and Dad to be present in their children’s lives. 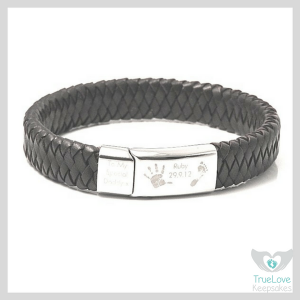 If you are shopping for a Dad who is sentimental, who loves having his children around, who marvels at their achievements, no matter how small or insignificant they may seem to others, then an Engraved Keepsake could be just thing! 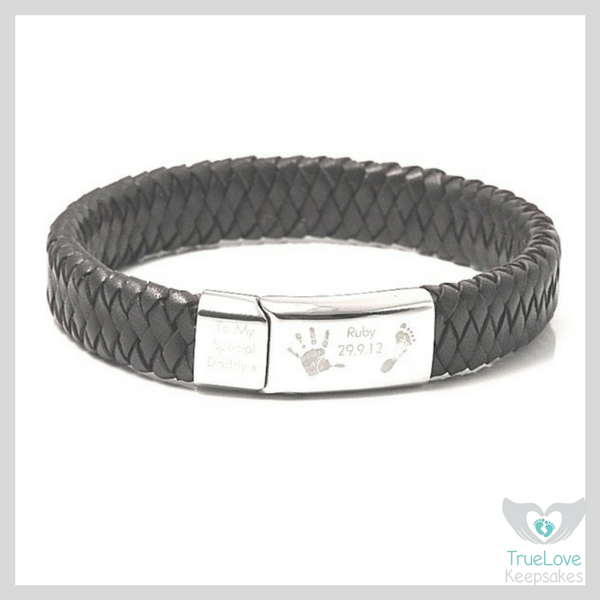 Daddy might just shed a tear or two this Father’s Day if he is lucky enough to receive a keepsake he can cherish for years to come. Is your other half celebrating his First Father’s Day? Has he amazed you with how well he has adjusted to his new role as a doting Dad? Maybe this year is the year to show him that that you appreciate all the love and support his has showered on you and his child or children. 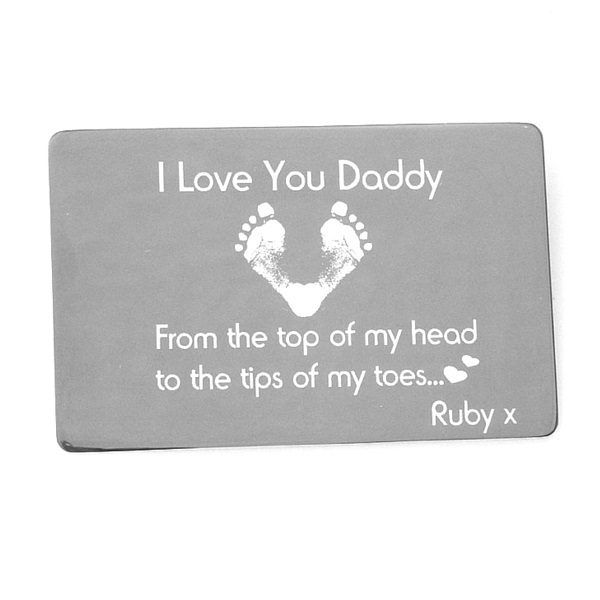 In the lead up to Father’s Day, which falls on Sunday June 11th this year, we are offering 10% off your order when you purchase any item(s) from our Engraved Range. 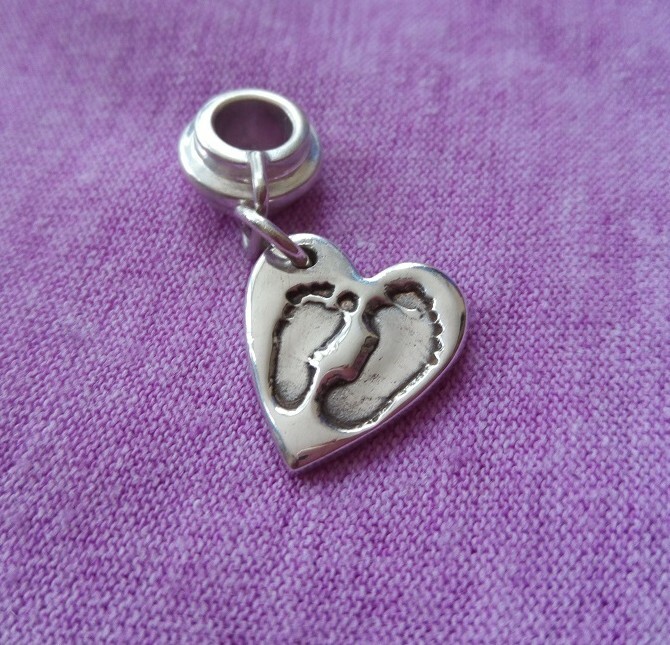 Our range includes gorgeous keepsake gifts and jewellery, all of which capture the unique handprints and footprints of your children. This Identity Bar Bracelet that can hold up to three hand/footprints with names as well as this Polished Stainless Steel Keyring. Why not add a date or special message to make it extra special? 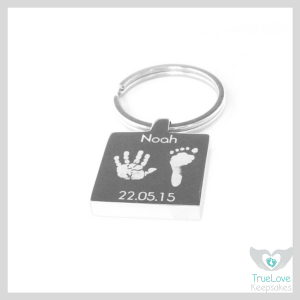 All of our Engraved Keepsakes come with a free print kit, together with full instructions. This enables you to capture the perfect print for your chosen gift. 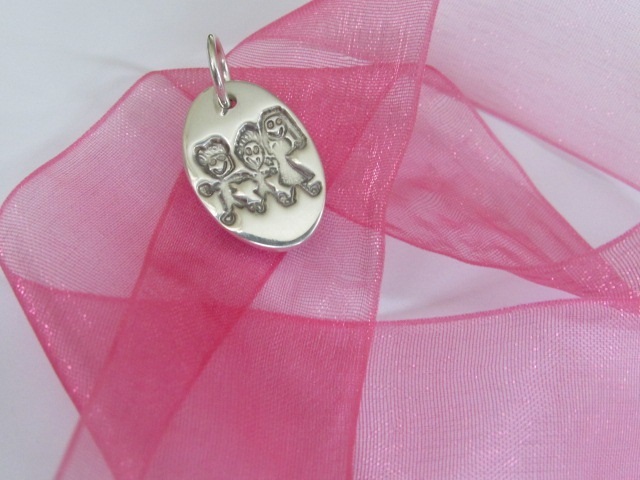 We can also capture a favourite photo of your child onto this stunning Photo Dog Tag or how about capturing that cute drawing your child has drawn of Daddy onto a Doodle Keyring? So how do I place an order for Father’s Day? A print kit will then be posted out to you and you can send them back to us using the Pre-paid envelope we provide you with. Then all you have to do is to sit back, relax and you’ll be notified when your order is complete. There are no extra hidden costs as we offer free UK delivery with every order plus there is no minimum spend. It’s really that easy to place an order with us, we aim to make it a hassle free process for all customers. You can be confident that you will be delighted in the finished item.